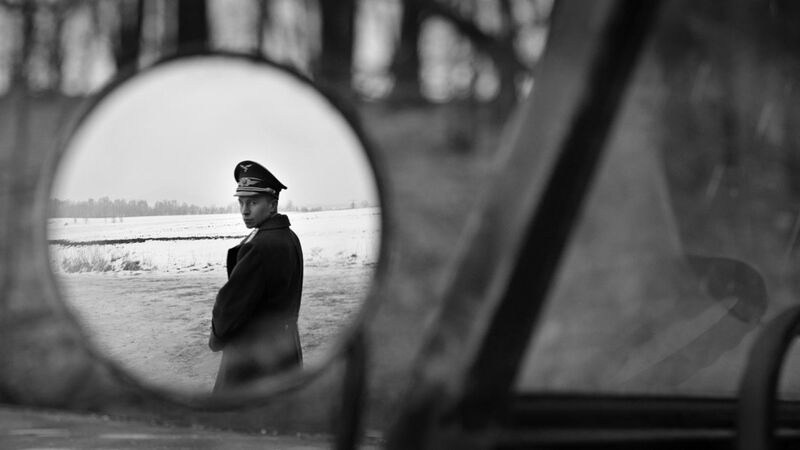 The Captain (Der Hauptmann) is an impressive, sad but darkly funny example of the notion that power corrupts not just the individual but those he influences. It is portrayed at a gradual and steady pace. Based in the final days of the war where Germany’s defeat was evident to most on Germany’s side, the first we see of protagonist Willi Herold (Max Hubacher) is immediate as he flees on foot, smothered in dirt, from a small group of German troops as they chase him briefly in a car while hurling taunts his way, possibly drunk as they chant ‘where is the little piggy?’ while one soldier discordantly plays a trumpet. This is the first of many examples of the extremely dark humour that peppers this film, though it no way detracts from the power of the story. Their pursuit is not thorough or long-lived, most probably due to the late stages of the war, the troops trying to have a little fun while they still can. After his pursuers turn around to find something else to amuse themselves, Willi wanders the barren wilderness until he eyes an unoccupied car. Hungry and cold, he carefully approaches the vehicle to scavenge anything useful. To his delight, he finds fresh fruit and warm clothes, clothes that turn out to be an entire captain’s uniform. The way the car is found, it forever remains an unanswered question as to why it was there. Surely a comment on the desperation of the last days, before the Third Reich was officially beaten. When he first finds the uniform he amuses himself by talking to no one, issuing orders that he had probably been given. It is a comical scene as his face slowly changes; his recognition of what he has stumbled across slowly appears on his face. He first appears to be scared when a soldier runs up to him and salutes him without thinking, an immediate reaction for a soldier who is low on the hierarchy of an army. Willi remains speechless as the soldier drives the car out of the mud and back onto the road. When he exits the car, Willi suddenly begins to build his disguise from being a deserter to a captain, ordering the solider to show him his papers, questioning him as to whether he is a deserter himself. This power that Willi suddenly feels leads him down an extremely dark path, where he deals with deserters, men who were in his exact position. Despite the power of his transformation, the movie is still able to elicit smiles as he soon finds drunken soldiers acting strangely, knowing the war is over. In fact, almost all the soldiers he deals with know the war is over, while in contrast to Willi who is overwhelmed by his newfound authority takes the situations he finds himself in seriously, seemingly unaware of the impending loss of the German army. 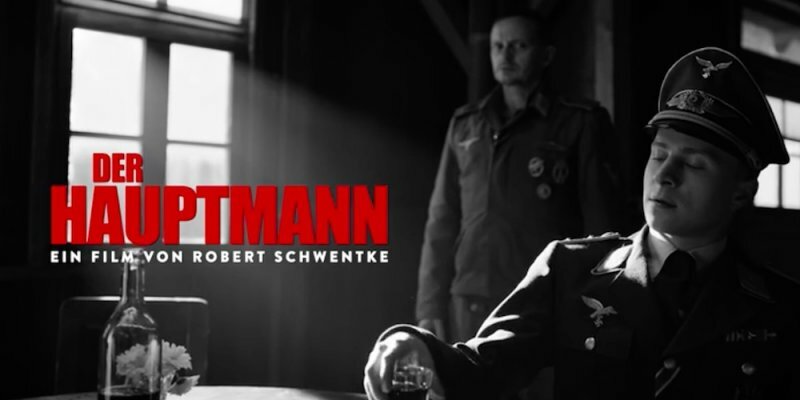 This commitment to the Nazi regime despite its imminent destruction paves the way for some horrific acts on his part; a far cry from the innocent looking man we initially meet at the beginning of the movie. Power corrupts all, and this film is a brutal and bloody example that applies to anything that has an authoritarian hierarchy, whether it be an army or a big corporation. The depiction of what men will do simply because a captain has authority over them is senseless, men acting without thinking for themselves and willing to blindly follow orders that become increasingly dark. His journey is a fantastic character study as well as a strong depiction of the power that consumes him. Max Hubacher as Willi offers an incredible performance that is instantly and consistently believable. This is a film that must be seen, the black and white colour scheme an accurate depiction of where the war was at, the darkness that consumes Willi, as well as the black humour that you will feel bad for laughing at. I caught up with this over the weekend and was really sucked in by it. It gets pretty twisted in the final act but it’s really good. And as you mention, the B7W cinematography is incredible.